For those of you who have paid your regular visits to arcades and amusement centers over the years would have noticed one particular trend – the presence of air hockey tables, that is. These happen to be all the rage many years back, where it was a game of reflexes and basically, carom on overdrive, although there are no pieces to knock into the opponent’s goal mouth other than the puck itself. 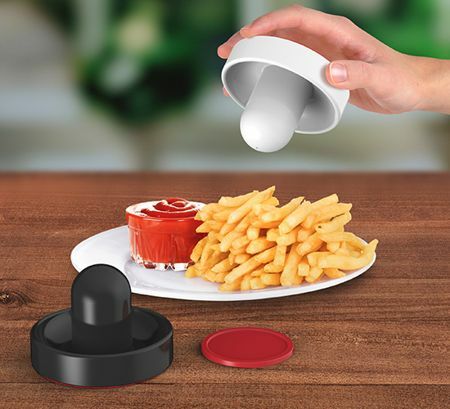 Well, you might want to be a bit more careful with the $14.99 Air Hockey Salt & Pepper Shakers, since shaking them the wrong way might cause someone to sneeze (if it is pepper we’re talking about), and salt would definitely leave a sticky residue all over the place. The puck measures around 3” in diameter, and each shaker measures approximately 3.5” wide x 2.5” tall.